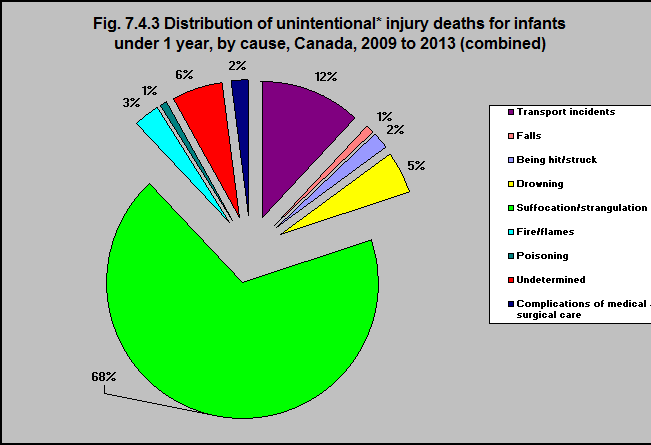 In the combined years 2009 to 2013, the most common cause of unintentional injury deaths among infants under a year was suffocation or strangulation – two-thirds of the deaths were due to this cause. The next most common cause of unintentional injury death among infants under a year was transport incidents followed by drowning. Ensure children have safe sleeping environments. One of the most effective strategies to prevent infants from suffocating is to ensure that they are sleeping in cribs or cradles that meet current regulations.1 In addition, they should not sleep with soft comforters, pillows, crib bumpers, stuffed animals – or other things that they could suffocate.2 Infants should always be placed on their backs to sleep and young children should sleep in cribs or cradles that were built after 1986. 1Parachute. Choking. http://www.parachutecanada.org/injury-topics/item/choking -accessed June 21, 2017. 2Nakamura S, Wind M, Danello MA. Review of hazards associated with children placed in adult beds. Archives of Pediatric and Adolescent Medicine. 1999;153:1019–1023.